I was excited to receive my August Julep Maven box today:) I wasn't expecting it! I am in the "It Girl" category and this is the only category where you get 3 nail polishes instead of 2 nail polishes and a beauty or nail product. This month's It Girl box follows styles that are trending now which are Metallics & Chromes. Sienna is described as a "sophisticated gold metallic". It's so cool looking in person. Melanie is probably going to be my favorite because I have nothing like it in my collection. I love blue nail polish anyway, but this is described as "pastel indigo metallic chrome". And the last one is Harley and it's described as "liquid silver metallic chrome". I can't wait to wear these and I would love to see how they compare to the new Essie metallic shades. If you are interested in trying Julep, feel free to click the referral link on the right side of my blog or go directly to the site on your own. 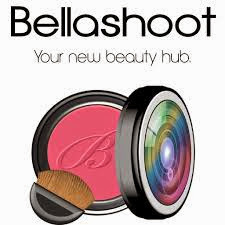 You can try it out for 1 cent by using code COLOR2012. This is how I started and although it sounds too good to be true, it's not....you really only pay 1 penny. You can cancel at any time, but I can't imagine why anyone would want to. The Julep polishes are amazing:) If you have any questions, feel free to ask! I am glad that your box was a pleasant surprise. Loved your post! 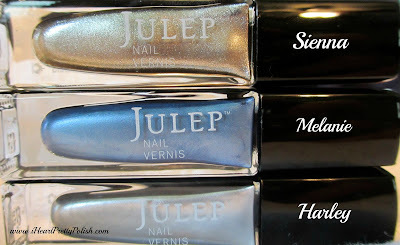 I am in love with Julep - I can't wait to get my box! I switched to a different box this month because I just bought the essie chrome so I'm getting the white/teal this month. I too am excited to see the difference between the 2! Oh fun! For some reason I didn't get the email this month to switch my box??? Weird. But I am happy with what I received. I didn't grab any of those Essie's yet so we will see how I like the chrome.